Dana Brown's documentary Step Into Liquid is most riveting when the camera is below, on top of, inside, or behind the water following ridiculous surfgods like Laird Hamilton. It's not nearly as compelling when it turns the surfers into talking heads. Let's face it: Kelly Slater is a long way from Robert McNamara in The Fog of War. But then again, McNamara wouldn't look that good in a bikini. When surfers speak of their sport, it always comes out as pseudo-mystical mumbo jumbo. But when a surfer disappears into the tube of a 60 foot wave and then emerges with just a second to spare as tons of water comes crashing down like the fingers of Neptune, and it's all captured on video by a camera at water level peering into the tube? Well, no talking is necessary to convey the stoke. And hell, they're already tan and good-looking and fit. If they were articulate as well, I'd probably kill myself. Thankfully, Dana Brown also depicts some surfers that don't look like Laird Hamilton, including a couple of yahoos from Wisconsin, the message being that surfing unites the world in a merry go round of love, connecting us to nature in the purest way. The real eye-opener, to me, was the foil board. Laird and other surfing revolutionaries attached a foil to the bottom of a board, strapped themselves on as if snowboarding, and invented a board that elevates the boarder up above the water. I had never seen this before and it blew my mind. 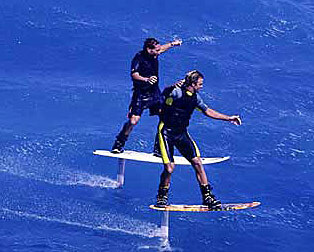 I can't even surf normally and already I want to try foilboarding or hydrofoilboarding or whatever they call it. It's so new it doesn't have an established name yet.